With the recent release of Microsoft Dynamics NAV 2016, there is a lot of new information to keep track of. In this article, we will provide a summary of the new features, links to Dynamics NAV 2016 documentation and guides, and links to training and readiness resources. Dynamics NAV 2016 introduced many exciting new features which are making the solution quicker to implement and easier to use. NAV 2016 allows business anytime, anywhere via new native apps that can be used on any device. The interface is optimised for touch and for keyboard and mouse. The web client has thoroughly been improved. It comes with over 60 new or enhanced features. It is now possible to create and configure workflows and workflow-events. 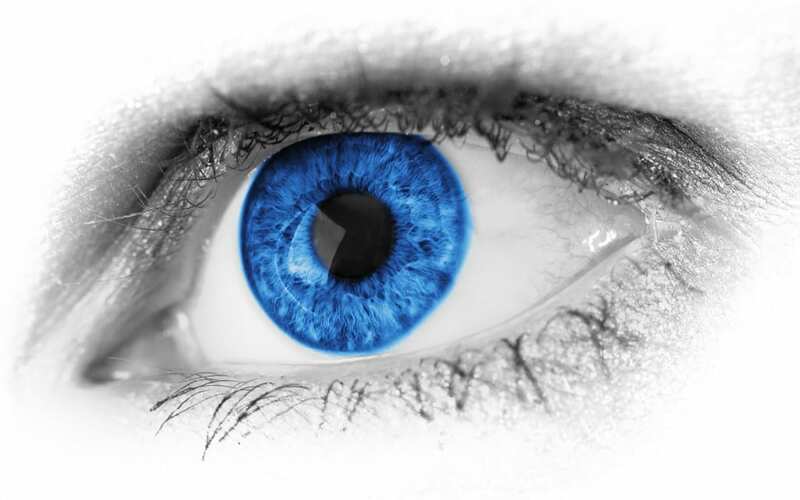 Document management and OCR capabilities have been improved. Integration with Office 365 has been enhanced. Dynamics NAV 2016 now offers a direct connection with Dynamics CRM. NAV 2016 works natively with Azure SQL extensions. NAV 2016 works with Power BI. Customisation extensions are now available. They enable consultants to customise certain aspects of NAV 2016 without code modifications. NAV 2016 comes with a Test Automation Suite which allows automated testing of the solution. 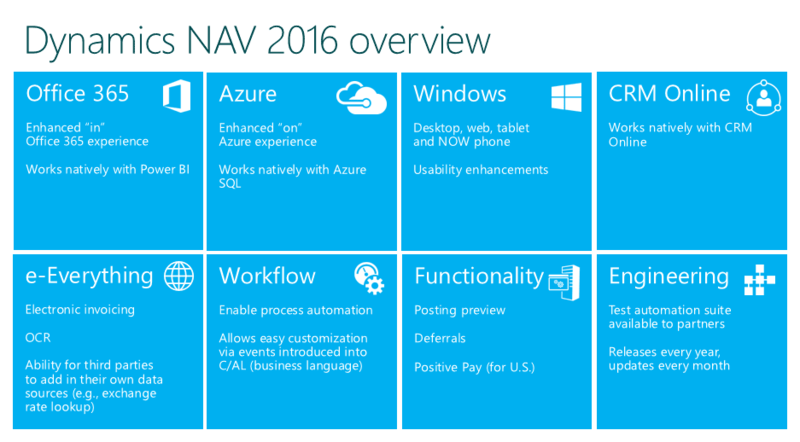 If you wish to dig deeper into NAV 2016’s new features and functionalities, here are a few useful links. Announcing the General Availability of Microsoft Dynamics NAV 2016 on the Dynamics NAV Team Blog. What’s new in Microsoft Dynamics NAV 2016 – the official Microsoft Dynamics NAV 2016 guide on PartnerSource. It will give you a summary of the new features and a wealth of supporting materials, including downloadable ‘How do I’ guides and best practice tips (if you’re an independent consultant who doesn’t have access to PartnerSource, find out how to obtain it here). Microsoft Dynamics NAV 2016: What’s New on Waldo’s blog: a deeper look into the new features from the perspective of a Dynamics NAV Technical consultant. NAV 2016 on MVPs’ blogs on Totovic NAV blog: a list of blog articles in which Dynamics NAV MVPs walk you through NAV 2016’s new features. Many new readiness resources for Dynamics NAV 2016 are now available online. This short guide will help you to decide where to start on your path to passing your new certifications and give you links to resources that can help you to familiarise yourself with the new solution. The best Microsoft Dynamics training resource available online is the Microsoft Dynamics Learning Portal (DLP). On this great training platform, you will be able to take Dynamics NAV 2016 online courses, watch How do I videos and practice what you have learnt in virtual labs. If you are an independent consultant who doesn’t have access to the Dynamics Learning Portal, 365 Talent Portal can help you get access to specialised Microsoft Dynamics training and professional resources. Taking your certification exams can prove very time-consuming if you have to travel to the exam centre every time. It is now possible to take your Microsoft certification exams online. A Dynamics NAV readiness page for consultants is available on PartnerSource. It provides readiness resources and downloads for Dynamics NAV 2013 R2, Dynamics NAV 2015 and Dynamics NAV 2016. – Obtain marketing materials and video demos for Microsoft Dynamics NAV. There are many great blogs out there. If you’re not sure how to find them, The Top 25 Dynamics NAV Sites by Dynamics 101 is a good place to start. Totovic NAV blog and Waldo’s blog aren’t on this list but are definitely worth a read (and these blogs both have ‘Links’ sections that will redirect you to additional Dynamics NAV blogs and to valuable Dynamics NAV resources).